Triple Glazing | Bedfordshire Windows Ltd.
Bedfordshire Windows Limited supply the only uPVC window specifically designed for triple glazing on the market today. Our Triple glazing will significantly improve the thermal efficiency and sound insulation of your home. 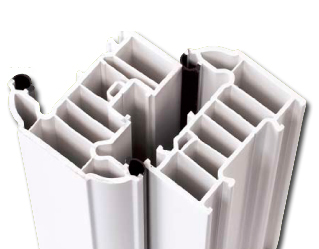 With three unique features, we offer the only UK window profile system specifically designed for triple glazing. 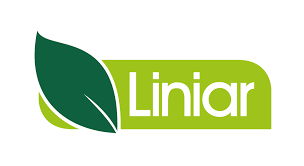 The Liniar triple glazing system will improve the thermal efficiency of your home by offering a multitude of energy saving benefits. Designed to accommodate a 40mm triple glazed unit, the Liniar triple glazing system is uniquely manufactured. The ‘flatter’ glazing bead allows the frame to fit perfectly into a thicker triple glazed unit. Larger and more structurally secure, our Trojan ‘Mega Egress’ hinge is ideal for triple glazing. Superior to standard hinges, the ‘Mega Egress’ hinge has great integral strength. Our 40mm sealed unit can achieve U-values as low as 1.0W/(m2K). 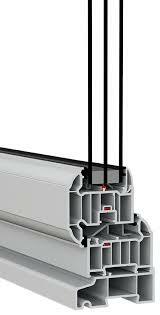 This multi-chambered profile helps to provide a consistent level of efficiency all around your home. How Can You Benefit From Triple Glazing? A triple glazed unit can be hugely beneficial to your home, with the chief advantage being thermal insulation. If double glazing isn’t helping you save enough energy then triple glazing could be the answer for a warmer and more efficient home. If you are looking to enhance heat retention within your home then triple glazing will help you to maintain a consistent level of warmth. 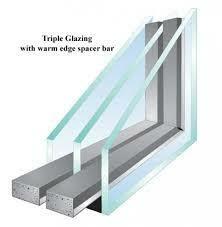 The 35mm glazing bead allows our triple glazed units to achieve extremely low U values. A low U value combined with a high level of solar heat gain makes a triple glazed unit extremely energy efficient. This high level of thermal efficiency means cold spots are eliminated. The extra pane of glass which triple glazing provides offers greater security for your home. Triple glazing makes a window a lot harder to break, although not as effective as our Acoustic Laminated option is still gives you peace of mind knowing your window is incredibly secure.